While I did get the direction right, my entry order was a bit too conservative. EUR/USD only made it down to the 38.2% Fibonacci retracement level before popping higher on account of better-than-expected non-farm payrolls. Oh well. 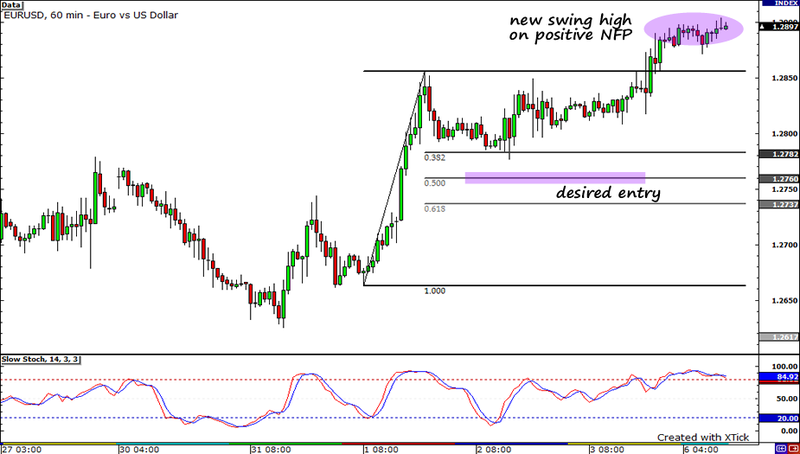 With EUR/USD making a new high, I’ve decided to cancel my open orders and look for opportunities elsewhere! Hey ya guys! I’m thinking that maybe today I’d show the euro some lovin’! Thanks to a combo of positive PMI figures, improved risk appetite, and a confidence-boosting holler from China, the shared currency seemed like it was hotter than Zac Efron on the charts yesterday! You know what, something tells me that the euro’s rally hasn’t come to an end yet. According to Pip Diddy, we have a couple of top-tier economic events on tap for the currency. I’m crossing my fingers that they would be able send the euro hustlin’ up the charts like a shopaholic on a Louis Vuitton sale. I know analysts aren’t as giddy as I am for the region’s second quarter GDP with the consensus just in line with its previous reading at 1.0%. But there’s a probability of it coming in as a pleasant surprise later given the strong GDP figures that Germany and France posted. There’s also the ECB‘s policy announcement later. Yeah, yeah. I know that the chances of the bank announcing an interest hike is like Paris Hilton winning the next presidential elections, but what I’m sinking my teeth into is the accompanying statement. The economic reports which the region has been printing have been relatively impressive so I’m thinking, maybe ECB President Jean-Claude Trichet will have enough reasons to be optimistic on the euro zone’s economy. On the technical side, we can see that the pair looks like it’s about to test last week’s high. 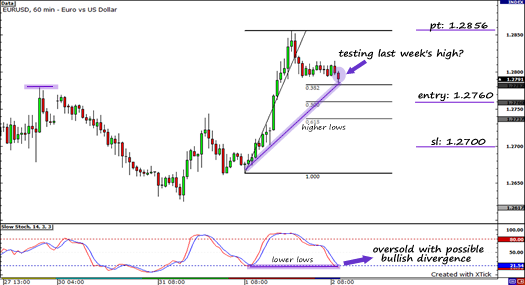 With the pair forming a bullish divergence, I think we just may see it pop higher again. While I think entering now is okay, I’ve decided to wait a bit and enter at the 50% Fibonacci retracement level instead for a better price. I believe my trade would be invalidated if price goes below the 61.8% Fib and reaches 1.2700, so I will place my stop there. If I get triggered, I will aim for former highs at 1.2850. Long EURUSD at 1.2760, pt at 1.2856, sl at 1.2700. I will risk only 1% of my account.